Plant-based medicines offer many healing possibilities for the body, mind, and spirit. 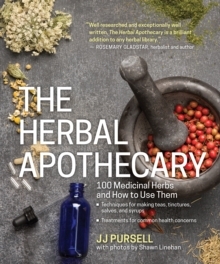 In this holistic guide, naturopath J. J. Pursell provides an accessible and comprehensive introduction to medicinal plants, explaining how they work and how to use them safely. Incorporating traditional wisdom and scientific information, The Herbal Apothecary includes advice on growing and foraging for healing plants and recommendations for plant-based formulations to fight common ailments, like muscle strain, anxiety, and insomnia. Step-by-step instructions show you how to make your own teas, salves, capsules, tinctures, and other essential herbal remedies. Whether you want to treat a wound or fight the common cold, taking charge of your health and well-being begins here.